my life has been a little underwhelming lately. yes, i do mean under, not over. don't get me wrong - i'm totally overwhelmed, but by some very underwhelming things. my job? not that exciting, but totally overwhelming. still having a christmas tree in my living room on the fifth day of march? bo-ring. but somehow overwhelming at the same time. row 44 of the body of rogue? same ole, same ole. but overwhelming enough that i haven't been able to make myself pick it up in over a week. so i've been in a little bit of a stalemate with my knitting over the past week or two. i didn't want to knit rogue, but felt horribly guilty picking up anything else. so i knit NOTHING. enter friday, march 3. otherwise known as "the worst day of my life." (yes, i've always been this melodramatic, just ask my parents). okay, okay, it probably wasn't the worst day of my life, but it ranked right up there. (i would also like to acknowledge that even if it were the worst day of my life, i'm pretty damn lucky if that's what counts as the worst (do you think i could use more parentheticals in this posting? (does anyone know if you're supposed to put the punctuation on the inside or the outside of the parenthetical?))). anyway, back to worst day ever. so i survived the day, obviously, but come saturday afternoon i was still feeling kinda sad. i thought to myself, if you could do anything to make yourself feel better, what would it be? and then it hit me - go to imagiknit, obviously! ryc classic beach - "Shot on location along the shingle coastline of Kent in England, this collection features designs for summer days relaxing & playing by the sea, beach barbeques, fish & chips in the rain, skimming stones, and walks along the beach." doesn't that sound dreamy? the patterns aren't bad either. sensational knitted socks by charlene schurch. this book is AMAZING. 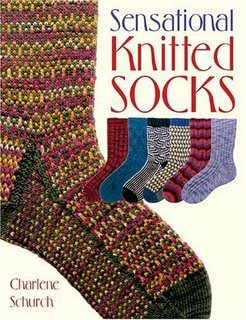 i've been wanting to dive into sock knitting for awhile but have been totally intimidated by the small needles, the number of needles, the small yarn ... this book breaks it down step by step. it also gives directions for using the two circular method of knitting in the round. which is why i bought some trekking xxl and two circular needles. i'm about two inches in on my first sock. i'm obsessed. and i'm feeling much better.